» Black Anodized Finish UPR's New Stealth Coil Over Kit without Springs. This new kit features a military type thread so it won't vibrate or seize. 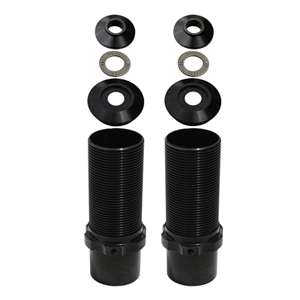 This is a revolutionary new design we have just come out with to eliminate the headaches of lost adjustment, utilizes a nylon tipped set screw. Our kits now feature a custom Anodized Finish to ensure the highest quality and best looking kit available! Quality Construction: CNC Machined from Billet Aluminum and hardcoat anodized for a long lasting finish and precise fit. No one else gives you the bold clean styling of our Aftermarket Dress Ups, Suspension and Performance Parts for your American Muscle Car like UPR Products! Installs in 1.5 hours or less. Click Here for Instructions Fits these Vehicles: 1979 1980 1981 1982 1983 1984 1985 1986 1987 1988 1989 1990 1991 1992 1993 1994 1995 1996 1997 1998 1999 2000 2001 2002 2003* 2004* GT V8 Mustang Steeda Roush & Saleen Vehicles. *Does not fit Cobra with factory Bilstein struts. Made in the USA!